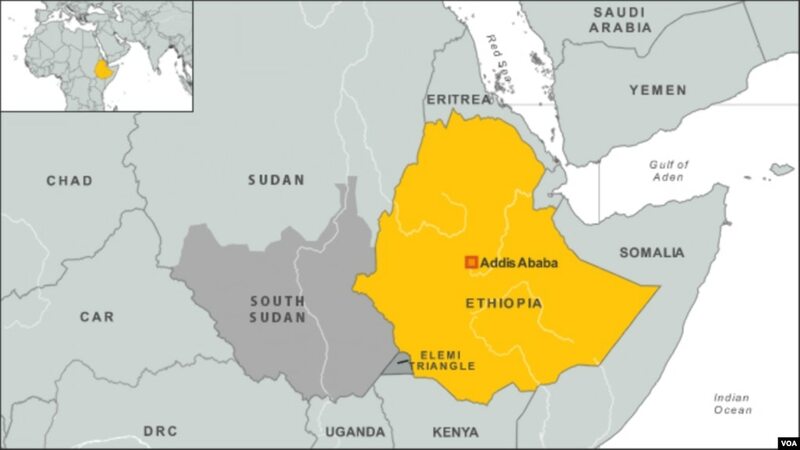 WASHINGTON — (voanews) At least 32 people have been killed in clashes across Ethiopia’s Oromia and Somali regions following clashes between rival ethnic Somali and Oromo forces, a former Ethiopian lawmaker said. Speaking to VOA Somali Service, Boqor Ali Omar Allale said at least 32 ethnic Somalis, including his younger brother, were killed on Monday night in Awaday, a small town between Ethiopia’s most holy Muslim town of Harar and its big eastern city of Dire Dawa. “They were innocent business people sleeping with their children and spouses. They were attacked in their homes and most of them beheaded. Based on the number of burial spaces arranged, we have at least 32 deaths, including my younger” brother, Allale told VOA Somali from Jigjiga, the capital city of the Somali region of Ethiopia. Other sources and relatives of those killed have confirmed the incident, although they have sough anonymity, fearing reprisals. One source said four of his cousins, who were transporting Khat — a plant used as a stimulant in Ethiopia, Kenya, Somalia, Djibouti and Yemen — were among those killed. So far, Ethiopian authorities have not commented on the incident. VOA could not immediately confirm the reported killings with Ethiopian regional and federal authorities. The alleged incident follows clashes between rival ethnic Somali and Oromo armed groups, which have been raging in areas bordering the Oromia and Somali regional states for months, but escalated this week into violent confrontations. Each side is accusing the other of being behind the deadly violence. Speaking to VOA Afaan Oromoo, Addisu Arega, the Oromia regional communication director, accused the Liyu (“special” in Amharic) police in the Somali region of crossing into the Oromia region and killing a number of people. Isma’il has also accused Ogaden National Liberation Front (ONLF) of starting the violence between the two communities, an accusation denied by ONLF spokesman Abdulkadir Hassan Hirmoge. “We have nothing to do with these clashes. The regimes in Nazareth and Jigjiga always play the two brotherly people against each other to divide or suppress them in times of public revolution,” Hirmoge said. Journalists in Ethiopia reported on Tuesday that at least two people were killed and more than 600 others displaced during protests across Ethiopia’s east. On Sept. 7, at least four people were killed near Moyale, a city in Southern Ethiopia, when Oromo militia armed with machetes attacked patients in a hospital, local media reported. Moyale, deep in Ethiopia’s dusty southeastern drylands and straddling the border with Kenya, is divided along the long-contested frontier between Oromia and Somali regional states. The city, in which three different flags fly side-by-side — the flag of Ethiopian federal government, the Oromo flag, and that of the Somali state of Ethiopia — has been a testament to the success of Ethiopia’s distinct model of ethnically based federalism, established in 1994. But analysts say the continuation of deadly ethnic clashes will endanger Ethiopia’s federal system. The latest violence comes a month after the Ethiopian government lifted a 10-month state of emergency imposed after more than two years of anti-government protests, mainly in the Oromia region. Ethiopian security forces killed more than 400 people in those waves of anti-government demonstrations, according to U.S.-based Human Rights Watch.